M44 Building Company builds pre-engineered metal agricultural structures from top-quality components that we source from numerous manufacturers in Canada and the United States. 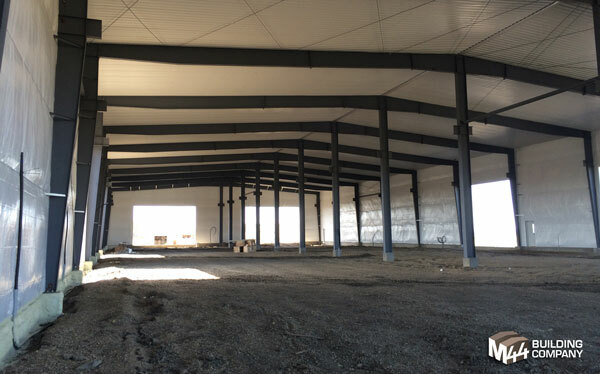 The most common types of buildings we construct include barns, equipment storage buildings, sheds, and other storage-type structures, but we have more than 15 years of experience creating custom buildings that work for our customers. Our consultants will work closely with you to determine your needs and budget and come up with suitable designs, and then our highly-trained crew assembles the buildings on-site, so that meeting your farm and agricultural building requirements becomes relatively quick and painless. You can concentrate on more important tasks such as getting the combining done, rounding up your livestock and gathering your equipment, all of which and more can then be stored in the strongest and safest metal buildings available. Contact us today to help you get the metal building you need. Have a project you’re thinking about? Contact us and lets talk about how we can help.